For its MY19 models, Maserati has announced limited-edition 'Edizione Nobile' versions of its Ghibli, Quattroporte and the Levante; to be sold exclusively in the United States and Canada. 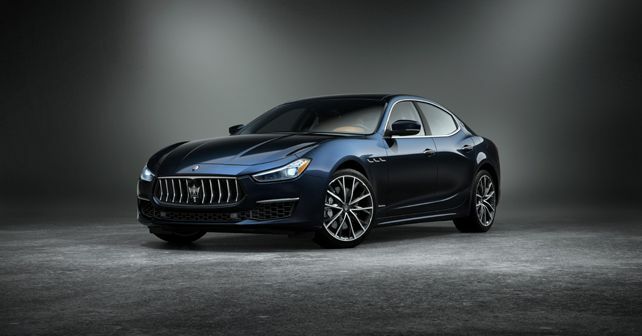 Maserati fans in the US and Canada now stand a chance to own the Maserati Ghibli, Quattroporte or the Levante in a bespoke 'Edizione Nobile' edition, as announced by Maserati. However, in order to maintain the 'bespoke' nature of these limited-edition models, Maserati will only produce 150 units in total, which means just fifty units of each of the three models. Exclusively available on the GranLusso models, the Edizione Nobile package features a 'Blu Nobile' tri-coat exterior paint, which is a new colour option for the MY19 model line-up. The exterior of the three models will also stand out thanks to the 20-inch alloy wheels and silver-painted brake callipers. Inside, the Edizione Nobile package highlights come in the form of a dedicated badge prominently displayed on the centre console and 'Sport' seats finished in a two-tone Pieno Fiore leather (found only in GranSport models). The cabin trim for the Quattroporte and Ghibli has been finished with high-gloss Rovere Wood while the Levante features a high-gloss metal net weave. In addition, each of the three models also gets Alcantara headlining, a Bowers & Wilkins premium surround sound audio system and heated rear seats. The front seats offer both ventilation and heating functionality. The 'Edizione Nobile' additions are not just cosmetic. What's also on offer is Maserati's Level II Autonomy Driver Assistance Package which includes a Highway Assist system, 360° surround view camera, lane-keep assist, active blind spot assist, Adaptive Cruise Control (ACC) with Stop & Go, Forward Collision Warning Plus, Traffic Sign Recognition (TSR) and a pedestrian recognition system as well. Deliveries of the 'Edizione Nobile' models to Maserati dealerships across the United States and Canada are slated to begin in December 2018.